Cordrea Tankersely- Wow. How can you forget a name like that. It just says, football player. Anyway, Cordrea was selected in the 3rd round of the 2017 draft by the Miami Dolphins. 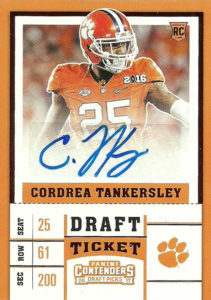 A throwback to the pure corner, Tankersely has an impressive set of wheels (4.4 combine 40 to lead all DBs), and is the man in one-on-one press coverage. The knock on him is that he doesn’t like to get his hands dirty in run support. (That’s okay. The same thing was said about Deion Sanders.) He really came alive in his final two years at Clemson. The pass covering machine blanketed receivers to the tune of 5 interceptions and 9 PBU to pace the Tigers in 2015, and 4 interceptions and 11 PBU in 2016. With a season ending injury to Tony Lippett in 2017, it appears Tankersely could be in for a bigger role in the Dolphins defense, after he impressed coaches with a solid preseason. He finished the season with 34 tackles and 7 pass breakups in 11 starts.